Have you been considering whether or not to pursue an advanced degree in creative writing—wondering what you’ll get out of it, whether it will be worth it, and how much it will cost? If so, join Blake Kimzey and Mag Gabbert from Writing Workshops Dallas as they host a panel of local writers in an open discussion of the pros and cons—and ins and outs—of pursuing an MFA in creative writing. This FREE roundtable event will take place on Thursday, October 11th from 7:30PM - 9:30PM at Deep Vellum Books. Topics will include the application process, available funding, job applicability, and much, much more! Attendees are encouraged to bring their own questions, or to tweet them in advance: #MFAQs @DallasWriters. 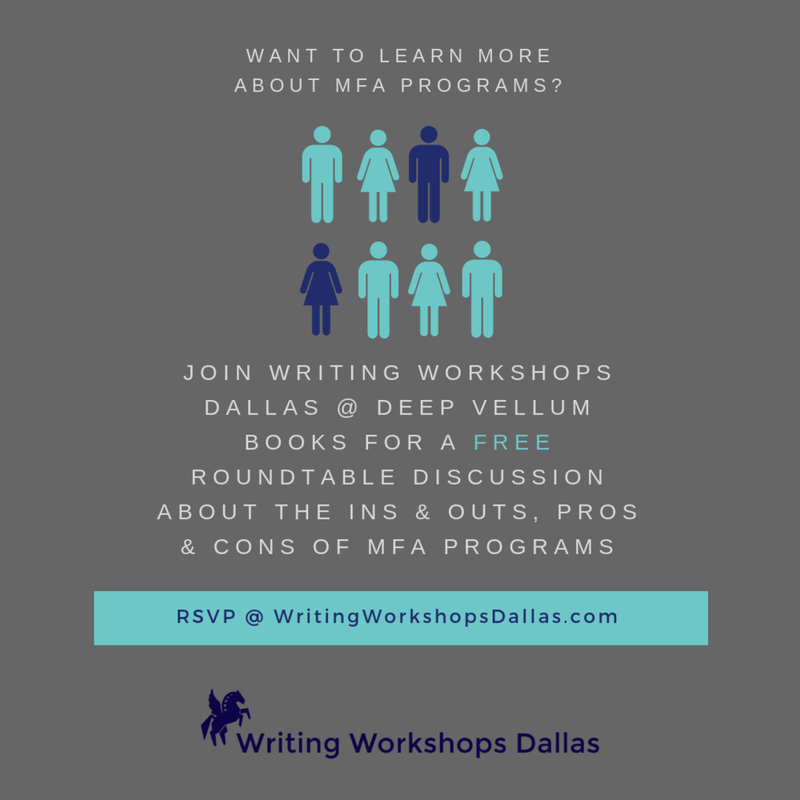 This FREE program is co-sponsored by Writing Workshops Dallas and Deep Vellum Books. To RSVP, click on the button below. Thank you! We look forward to seeing you at Deep Vellum books on October 11th at 7PM! We’ll send a reminder e-mail a few days before the event. Let us know if you have any questions between now and then!